With its newly developed advertising format called iPROM Shake Ad, digital agency iPROM offered its clients an innovative solution that improves user interaction, ensures increased engagement and drives an improved presentation of certain product features. iPROM Shake Ad is an advanced and responsive advertising format that makes it possible to display various creative designs of an ad. 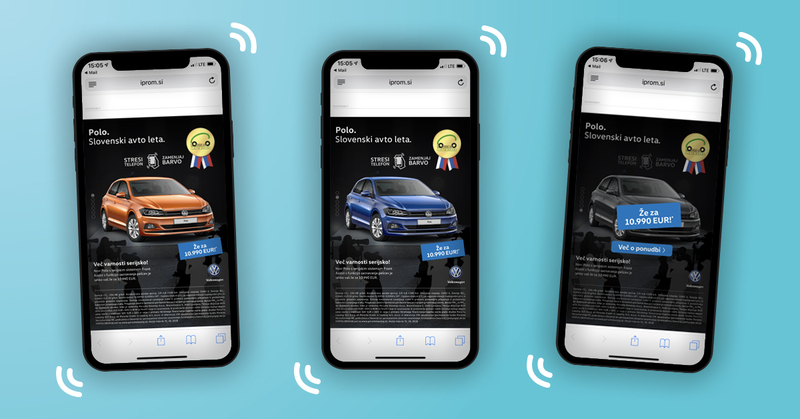 Volkswagen already used the new ad format in its advertising campaign “Polo – Slovenian Car of the Year 2018”. “Constantly connected digital media consumers require more – they want more dynamic ads, better immersion, a different approach to storytelling that, in the flood of digital media advertising, captures their attention at the right time and in the right place and holds it for longer. These were the principles that guided us as we developed the iPROM Shake Ad format. We want to make sure our clients realize the potential of new technologies and capture the users’ attention primarily on mobile devices, which are increasingly used to access the web,” explained Andrej Beširevič, Head of Digital Concept Department at iPROM. iPROM Shake Ad is an advanced and responsive ad format that makes creative designs more dynamic. The ad format is available on all smart devices with a built-in gyroscope or accelerometer (Android, iOS) and allows users to change an ad’s creative design by shaking the phone. On devices without a gyroscope or or accelerometer, users can slide their finger across the screen for the same effect. On desktop PCs, the creative design can be changed by clicking on the ad. Volkswagen was the first brand to include iPROM Shake Ad into its digital strategy. It was part of its “New Polo – Slovenian Car of the Year 2018” advertising campaign, as the company recognized the advantages the ad format brought to the presentation of a new car. Volkswagen selected the colour-changing ability to showcase the Polo in a broad range of colour versions and help users imagine how the car looks in their favourite hue. You can see the iPROM Shake Ad for the new Volkswagen Polo here. The advertising format can be used for various products and in different industries. It provides advertisers and creative designers with the ability to use advanced technology to tell stories through digital advertising in an innovative and a dynamic way. iPROM’s clients can use iPROM Shake Ad in combination with iPROM Cloud to take advantage of the latest targeting methods and track all traditional and advanced metrics, such as time of exposure and how long an ad was in the user’s field of vision. In relation to the new ad format, iPROM offers its clients additional metrics for optimizing advertising strategies that include information about how often a user shook the ad, the number of times individual creative designs were shown and the number of direct responses to a specific creative design in each ad. The format is suitable for direct sales advertising campaigns as well as branding efforts.